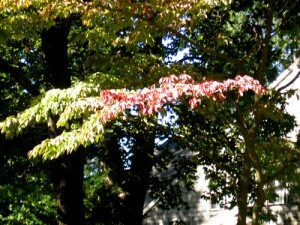 I posted this on www.divorce-dayz.info, and I am posting it here as well, because it’s the best photo I have of early autumn, when the leaves just begin to change. Since October is my favorite month, because the leaves are so colorful and the air is nice and crispy, the way I like it, I hope to post often so I can squeeze in as many fall pictures and timely articles as possible. First, end of season foods are always plentiful this time of year: purple eggplants, red bell peppers, yellow summer squash, red and yellow tomatoes, greens, and of course, apples, pears and grapes. Below is a recipe that I made using some of the veggies listed over fresh greens. It will be my first recipe for October. 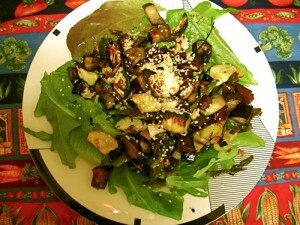 This is the photo of baked/grilled veggies over greens. Recipe is comingÂ soon…. When I was in Seattle this summer, my husband and I had dinner with my friend Barb Schiltz, a nutritionist who lives on an island off the mainland. 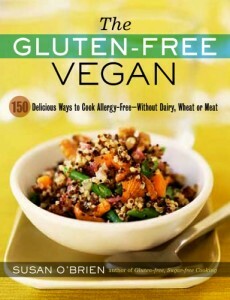 She told me about a vegan, gluten free-cookbook written by her friend, Susan O’Brien. I obtained a copy and will review it this month. Here’s a photo of the cover. I recently met a woman who belongs to an autistic support group called Sonrise, named after a book with that title and written by a couple who had an autistic child that is now totally well. The woman I met, a mother with an autistic preschooler, told me that all the children in her support group are on a gluten-free, dairy -free diet, so if you know anyone that might find this book useful, especially someone with an autistic child, I recommend Susan’s book. October is breast cancer awareness month, and as part of this “campaign,”Â I hope to profile my friend Dorothy, who was diagnosed last year and is doing very well. I also have an article called Pink Link that I wrote to emphasize the importance of investigating companies that look like they are helping wipe out breast cancer, but according to the non-profit organization, Breast Cancer Awareness all is not what it may seem. Below is the logo of the Breast Cancer Action and you can read more on the website: www.bca.org. I will also be posting some of their information during the month. October 1st, tomorrow, is World Vegetarian Day (WVD), so you might want to try one of my vegetarian recipes for breakfast, lunch, or dinner, or maybe all three! 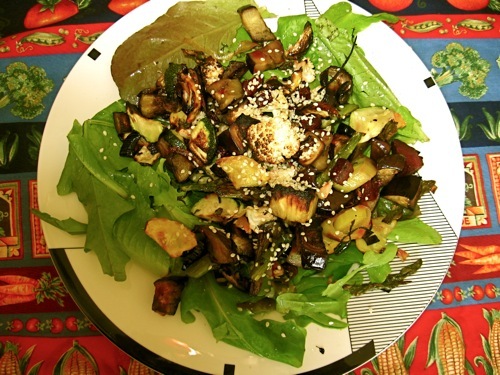 !Â Even if you are not a vegetarian, experimenting with a vegetarian diet can be interesting and healthful. I will post an article about meatless Mondays this month to get you started on eating your veggies! If you go to: http://www.worldvegetarianday.org/ you will see lots of information on this important topic. Here’s the logo for WVD from the website. Also, to drive home the importance of a “clean” diet and breast cancer prevention, I copied this excerpt from U.S. World News & World Report from the web. It links Breast Cancer Awareness month with World Vegetarian Day. “The connection between eating red meat and breast cancer has been studied before, with no clear conclusions. This study, published in the Archives of Internal Medicine, zeroed in on premenopausal women between the ages of 26 to 46 and looked not just at overall rates of breast cancer but at the incidence of different types of the disease. About 60 percent of breast cancers are fueled by the hormones estrogen and progesterone; the thought is that certain components of red meat, including compounds that develop when it’s cooking and hormones fed to the animals to spur growth, could encourage the development of that kind of cancer.” I urge you to Google the link between breast cancer and red meat, and seriously consider cutting down on meat and adding more fresh fruits, veggies, whole grains, beans, sprouts, and sea veggies to your diet. Finally, in case you did not see the posting in September, all my books are now available to purchase. Just click on this>>> My Books .Â This link will take you to the Home Page and you can click on My Books on the left, which will take you to a description and prices of all the books below. 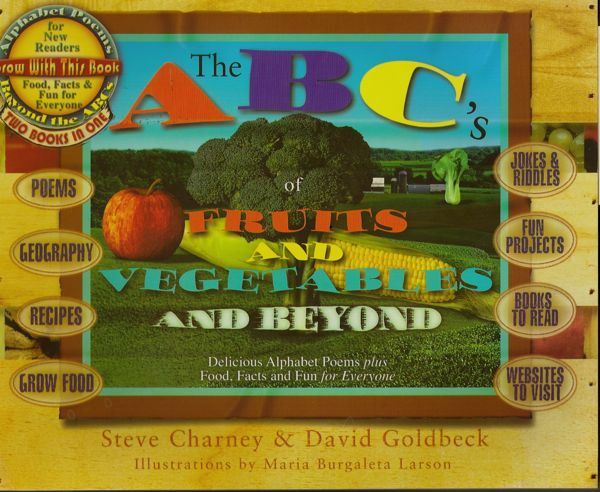 Well, thatâ€™s how I feel about Steve Charney & David Goldbeckâ€™s book The ABCâ€™s of Fruits and Vegetables and Beyond.Â Itâ€™s an alphabet book; itâ€™s a poetry book; itâ€™s a cookbook,; itâ€™s a riddle book; NO, itâ€™s a Superbook! And it is, as the cover will tell you. 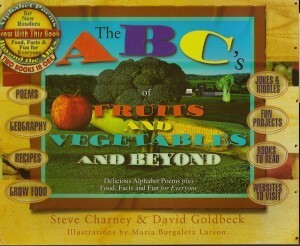 The subtitle is Delicious Alphabet Poems plus Food, Facts and Fun for Everyone. And the handy ovals on the cover are like a Table of Contents which read: Poems, Geography, Recipes, Grow Food, Jokes & Riddles, Fun Projects, Books to Real and Websites to Visit. In its pretty yellow suit. After the Part One, alphabet poetry, is a second section on Food, Facts, and Fun for Everyone in alphabetical format, starting with Beyond A and ending with Beyond Z. 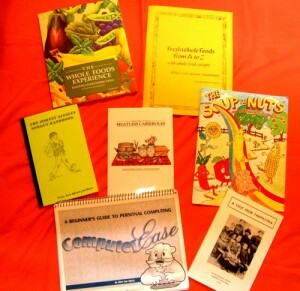 In this section are recipes, for example, ABC Applesauce, apple facts, a joke about apples and apple information, such as how to keep an apple from browning.Â Again, this section has information in colorful blocks with bright colors all over the page. Co-author Charney is an entertainer for children, a musician, ventriloquist, songwriter, radio personality, and author. Co-author David Goldbeck is co-author with his wife Nikki Goldbeck of nine food and nutrition books. (I reviewed their book Healthy Highways (Check when??) Illustrator Larson is a graduate of The Cooper Union (NYC) and a Fellow of The American Academy in Rome. The alphabet book for readers & eaters, as the back cover states, is published by Ceres Press and available through Amazon.com for $16.95 new and less for used copies. Click on the icon below to order. You are currently browsing the Menupause weblog archives for September, 2010.